Since the change in staff at the beginning of the 2016-2017 school year, Matt and Cindi Hannes have started cooking delicious hot meals for students and teachers Monday through Thursday. The name Kelly’s Kitchen was inspired by an AOA alumnus, Kelly Ferguson. Ferguson was following his dream of becoming a chef by attending the Culinary Institute of America when he was involved in a fatal car accident while visiting his family. In the summer of 2014, following his death, his family had a mural painted in the Alpha Omega cafeteria and dedicated it in his honor. Ever since then, our school cafeteria and kitchen are affectionately referred to as Kelly’s Kitchen. The lunches are on a three-week rotation. This ensures that students never get tired of eating the same food. Matt Hannes refers to his cooking as “home cooking with a twist.” Each day has its own theme. The week starts out with “Monday on a Bun Day,” and is followed by “Taco Tuesday.” Wednesday is “World Wide Wednesday” followed by “Throwback Thursday.” Friday’s are the cooks’ off-days, and the students enjoy pizza delivery. Matt Hannes started working at Alpha Omega in August of 2016. His wife Cindi joined him as his assistant after the numbers grew too large for him to handle by himself. 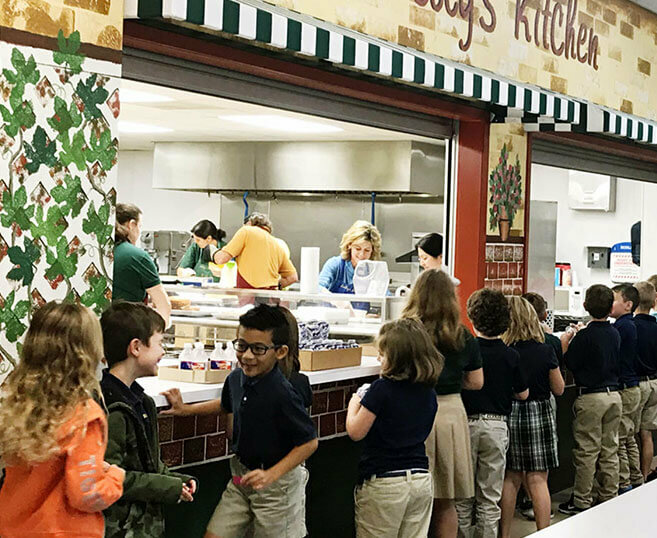 No matter what day, the lunch line can be seen wrapping around the tables and up the ramp as the kitchen staff serves between 150 to 200 trays per day.